Varadero is Cuba’s top tourist destination. And is famous for the beaches that run 20 km down the Peninsula de Hicacos. If you go there you can stay in Casas Particulares in Varadero. This location became a fashionable place for the wealthy in the late 19th century. When many rich families from Cardenas bought land there and built summer residences. Nowadays, there are many good hotels on the beach which is known for its turquoise waters and white sands. It also has an aquarium and a golf club. Read more in Bed and Breakfast in Cuba. It is a tourist destination in the Province of Matanzas. 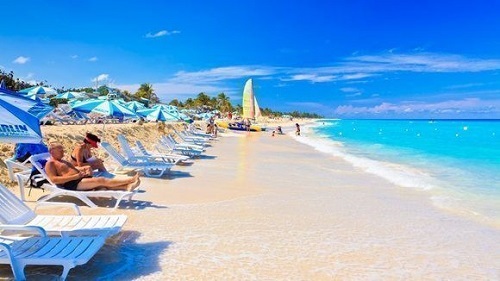 Its famous beaches are part of the tourist industry in Cuba. In fact, that is the most important industry in this island. Varadero is known as a resort town. In this place, you will find a large number of hotels, more than 60, big and small hotels, for all kind of tourists. Also there you can find resorts (it´s home of the biggest resort in the Caribbean). The beaches are the main attraction in Varadero. Now it is a popular destination, but in the 1870s this place received the first tourists. And for many years it was an elite place, only for the rich people. In the 1930s the tourism grew so much, it became a place for famous and rich people. For example, Al Capone visited this place. But then, when the Cuban Revolution started in 1959, the mansions were expropriated. And some of them became museums. Varadero was not anymore a place for rich people, everyone could go there. And as a symbol of that tourism integration, they built the Parque de las 8000 Taquillas in 1960. It´s a must visit place when you go to this part of Cuba. It´s so popular that the surroundings of the park became the city center. Varadero became a cultural center and a sports place. And then reborn as a tourist place, in the 90s. When international tourism opened, they built many hotels there that belong to international chains. Opening Varadero for international tourism changed a lot of the traditional culture of this town. Because it meant the arrival of people from other cities of Cuba and from all over the world. As Cuba top tourist destination, the beaches are part of the scene. There you can find beautiful beaches and some natural attractions like caves and virgin cays. That´s why one of the reasons to visit Varadero is doing scuba diving... so if you like this sport or will like to learn it, you should go there. Apart from scuba-diving, you can go deep-sea fishing or yachting. But if you are traveling on a budget there are many other activities you can do, like water sports. Another main attractions, besides the beaches, are the cultural, historical and environmental places. You can go see the mansions we mention before that became museums, or explore the natural forest. If you are an adventurous traveler we recommend you to stay in casas particulares. These homes are an excellent choice if you want to get in touch with locals and get to know the cultural roots of Varadero. You will stay in comfortable rooms with all the facilities... and save money which you could spend at the tourist attraction like scuba diving. Don’t forget to visit the Varadero Beach, take a city tour, and go to the Saturno Cave, the Coral Beach, and the Josone Park. This is one of the main attractions. Varadero still has its luxury air of another time, tourist from all over the world visit it. You should not miss it. Contact us to book accommodation in casas particulares in Varadero and start planning your trip to Cuba.